My sermon from Ash Wednesday Evening Service (February 14, 2018) on Matthew 6:1-6,16-21. Listen to the recording at the bottom of the page or read my manuscript below. I don’t know what it is about Ash Wednesday but, for me, today is a day filled with a very full silence. Even the loud sounds that I know will come, like the bellowing of the organ and the cry of a 3 year old child, seem to be less intense than normal. When I prepared the ashes for today, the clang of the metal can bouncing on the top of the metal grill didn’t disturb me like it’s suppose do. And the pops and crackling of the burning palm fronds was barely audible. I found myself over the last several days falling into an old Ash Wednesday pattern where I keep asking people to repeat themselves because, even though they’re speaking at their normal volume, the silence of this day keeps drowning them out. The sounds of everyday living – from ash making, to cars honking, to the music we sing – on Ash Wednesday, these sounds collide with a day that is already full. Because Ash Wednesday isn’t just another day on the church calendar. Ash Wednesday is an interruption of our everyday expectations. And this interruption starts with the date itself. For one thing, Ash Wednesday takes place on Wednesday. It shows up in the middle of our week. And it’s never the same date year to year. It can show up in early-February or right next to President’s Day Weekend or skoot all the way into early March. 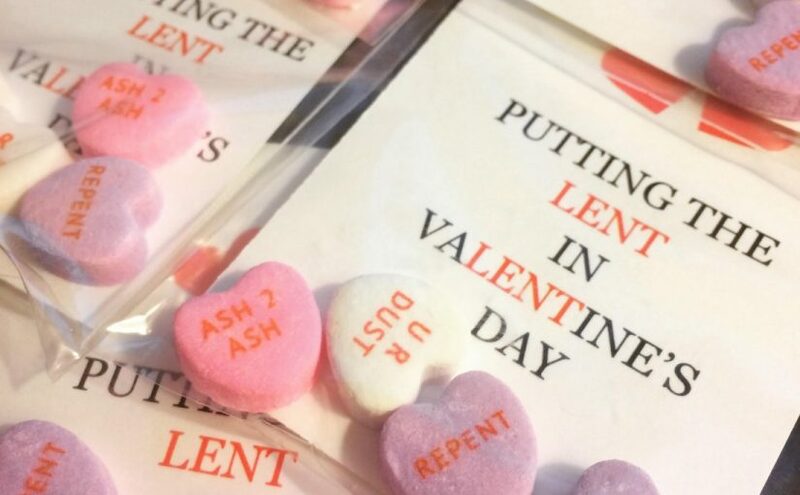 Ash Wednesday can even show up on Valentine’s Day, which it hasn’t done since 1945 but will do again two more times before the year 2030. Ash Wednesday this year has inspired reporters, theologians, pastors, and priests to interrupt their normal routines and have a little fun. They’re busy sharing punny memes online, creating Lent-friendly heart shaped candies, and writing a bunch of articles wondering if it’s okay to eat Chocolate on this first day of Lent. Whatever our expectations for what this 2nd full week of February is supposed to bring, Ash Wednesday shows up, interfering and disrupting our normal routines. It inserts itself, almost without asking, into the busy school, work, sports, and life schedules we’ve already created. And when Ash Wednesday shows up, it does something a little odd. The day isn’t, I think, trying to give us one more thing to do. Even though we’re here at church and some of us will have ashes placed on our face, we’re not here trying to just fill up our time with our actions. Ash Wednesday isn’t a day centered on what we do. You’re here but it isn’t to do something. Rather, you’ are here to rediscover who you really are. Ash Wednesday interrupts the ways we fill up our time and our sense of self-worth by doing and doing and doing – And instead invites to remember who and what we already are. And that Ash Wednesday proclamation is declared during the silence. Dust, on its own, cannot live or move or make much noise. There’s nothing that dust can really do. It cannot fill its time or run around doing all that it can to give it some sense of meaning. When it comes to what is eternal, when it comes to the divine, dust…can’t say much. Instead, dust can only sit in its silence – and wait for a sound that gives it meaning. Wait for a voice that says it matters. Dust needs that word that says its loved. On Ash Wednesday, the silence is a paradoxical kind of place. On one hand, we are confronted by who we are and our own mortality. And yet, in that very same moment, we are assured of the eternal promise God gives to us. Whether you chose to wear the ashen cross on your forehead today or not, all of us carry that mark of Christ. We carry this silent sign of who we are and who we belong to during every moment of our everyday live. And in those moments when we are surrounded by bellowing noise and in others moments when silence is all we have, Jesus promises that you are known and loved. Your imperfections will not cause God to abandon you. And the promise of God’s love for you doesn’t end because of what you ever you’ve gone through. t’s through our connection with Jesus Christ that we learn to stop trying to fill up our lives and we discover how Jesus fills us with His life instead. The silence of this moment, the silence of this Ash Wednesday, is how God interrupts our life right now to tell us that we are known, that we are seen, that we are cared for and that we will be, forever, loved.